Garden plaques are available in all shapes, sizes and styles. Very popular garden plaques are the wall hanging plaques that can be used in both the house and garden. Decorative plaques can be personalized in many ways, you may create custom address plaques, as well as memorial plaques, or have one created to remember a special event or Holiday. 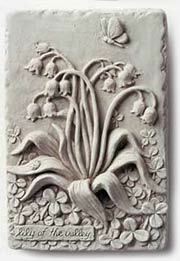 Resin types of materials are used to make most garden plaques today. This is because they are light weight for hanging on the walls, and are weather resistant, and they can also be made with great detail on them. Others are still crafted out of stone, metals, and other natural materials.A garden plaque is the perfect way to add an extra touch and theme to your environment. If you are a bird lover, a fan of frogs or turtles, you will be able to easily find a plaque. There are others of the sun and moon, mythical figures, Asian designs, as well as joyful and humorous expressions. If you have an idea in mind, you can find a garden plaque to fill the space, and if necessary, have a custom plaque made. Garden plaques also make great gifts! A garden plaque is the perfect way to add an extra touch and theme to your environment. If you are a bird lover, a fan of frogs or turtles, you will be able to easily find a plaque. There are others of the sun and moon, mythical figures, Asian designs, as well as joyful and humorous expressions. If you have an idea in mind, you can find a garden plaque to fill the space, and if necessary, have a custom plaque made. Garden plaques also make great gifts!